O Lord Jesus Christ, who bought us by thy Blood: Help us to follow thee and the company of Saints in merciful thought and loving deed; and especially after the gracious pattern of thy servant Giles, make us pitiful to the poor, tender toward the crippled and broken, and humbly obedient unto thee, who livest and reignest with the Father and the Holy Ghost, ever one God, world without end. Amen. 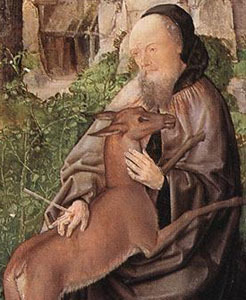 O God, who revealest the hidden life of the soul, and guidest thy chosen along the pilgrim roads to seek it where they may find it: Grant that we may still be inspired by the example of the Hermit Saint Giles to count all things but loss for the knowledge of thee; through Jesus Christ thy Son our Lord. Amen.